Scottish singer-songwriter Tallia Storm has been gracing UK small screens since her teenaged introduction by Elton John. Throughout music, fashion, and television realms, Storm has developed her footing and is posturing herself for spotlights beyond the independent circuit of Teenage Tears. Backed by her innovative relatives, and notable luminaries alike, the 20-year-old songstress is paving a melodic lane of her own. So, become acquainted with the R&B star streaming heavily across the pond. The Knockturnal: Your music is ordinarily light-hearted and upbeat, but the songwriting on your latest track, “World on A Slope,” is heavy. What experience inspired this shift sonically? Tallia Storm: ‘World on A Slope,’ is about the overwhelming sensation [or notion] that everyone around you is doing better than you. It alludes that everyone around you is happier, prettier, thinner, more ambitious, talented, luckier or more successful than you. I wrote this song during the summer, and I must be honest, I wasn’t in a good place. Despite being surrounded by a big family, I still felt quite alone. To everyone else, my life looks wonderful and, in many ways, it is. So, I thought, how could anyone understand? I questioned how I could I possibly be sad when my life is so full of light? I [acknowledge I am] fortunate to have so much love. There is glamour, and there are so many adventures in my life. But, behind it all, there is always a dark side [to the spotlight]. That is fueled by social media and is my insecurities. It is a [source of] anxiety. Songwriting merely is storytelling, so I decided to share my story. Sometimes life is an emotional roller coaster, but we have just got to get on with it. The Knockturnal: Tallia Storm, you were discovered by Elton John at such a young age. What was it like touring and being introduced to the music industry at 13? Tallia Storm: Well, in all honesty, I didn’t know anything different. It was my choice. [The same way] someone wants to [play] football, become a swimmer or any other professional athlete — I wanted to sing and perform. So, I was hustling and working to make that happen. I am a trailblazer. If you want something badly enough, you have to keep working hard, no matter what. So, did I miss out? Well, I didn’t go to parties or hang out with friends much. I was totally immersed in my craft. I still am, to be honest. The stage is my happy place; I feel alive when I am singing live. So, for me, it’s good fortune — to be able to do that from such a young age. I grew up fast but wouldn’t ever change it for the world. The Knockturnal: What ran through your mind the moment you opened Elton John’s world tour in Scotland? I would have stayed on that stage all night. The adrenaline, the rush, the ability to sing your own songs to a live audience – it doesn’t get much better. I also felt a degree of responsibility. I didn’t want to let him down. He took a huge risk on me. He had never heard me live, so I had to nail it. The Knockturnal: Describe your “More Than Friends” studio session. Songs are stories, and all my songs are written organically based on my emotions. The words just come out – free flowing. For this song, we had been jamming on the keyboard and came up with this great melody. My writing partner and producer – Alex is a wonderful pianist. He just gets my vibe. He came up with this excellent hook, and I just sang the chorus. [At that moment], I was going through the tune’s situation in my real life. There’s always a man who’s the culprit, right? [Laughs] He kept me dangling, at the side, and there I wished we could absolutely be more than friends. You know in many ways, my songwriting is very cathartic, like therapy. It’s better to get it off your chest. We carried on recording well into the midnight hours. When you are onto something you don’t come up for air – you just keep working. 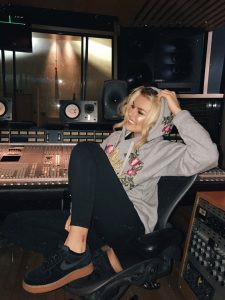 Tallia Storm: I adore Nile! He got in touch when I was 14 years old, after hearing a track that Eva Longoria shared. He invited me to speak at TedXTeen in NYC, and perform. It was incredible. Nile and his partner Nancy are true disruptions. They encourage the next generation to really aim high, to strive for the best and be the best version of themselves. He’s a legend and icon, and I feel very grateful to know him. I then performed at his London TedXTeen event again, and we jammed on stage together – freewheeling with Nile Rodgers. It was another pinch me moment. When it came to a song about how girls are changing the world, I knew exactly what I wanted to do. So, my mother encouraged me to storyboard it and direct it myself. My family members are all very creative and have always worked in the marketing sector. They are very enthusiastic about pushing the boundaries with ideas. That’s what I did. I got all my girlfriends, and we literally shot it on a tight budget in the streets of London. It was a lot of work but worth it. The Knockturnal: The song, “Forever” is a viral favorite. What record from your debut LP, Teenage Tears best describes where you at present? 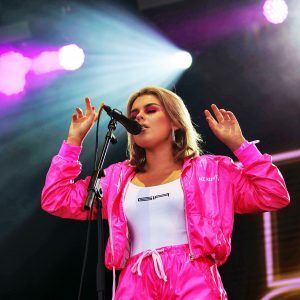 Tallia Storm: Gosh, excellent question – every song tells a story! They are all little nuggets and periods in my life. Some talk about the fun times, and breakups, but the song “Everyday” was about my mum battling cancer. The record “California” was about loving LA so much and not wanting to leave. I think the tune, “I Just Need You” might [describe where I am], as I am a firm believer that age doesn’t matter. There are so many stigmas that need to be broken… if we are brave enough to challenge them. The Knockturnal: Can you explain the message behind, “The Good Lie” music video? Tallia Storm: “The Good Lie” is about the mistruths and white lies we share on Instagram. Spending hours getting that all-important shot, pretending life is so wonderful. You know, convincing the world we are having such a good time. I called it “Good Lie” because frankly, we all do it. In truth, I think people have embraced that. It’s sad in many ways, but are people going to change? No, of course, they are not. They are good lies, or escapism, so to speak. [Users are] dreaming, meandering through that complicated social landscape called Instagram. Our grams [can serve as] a barometer of our cultural identity now. The app is an iconography of our lives – take that any way you want. There are little white lies in there all the time. The Knockturnal: How was it being involved in the family project, Sir Billi? Tallia Storm: Gosh, it was a big part of my parent’s life. They were the David in a Goliath film industry. [My parents] convinced Sir Sean Connery to be their business partner. He is a star in the animated feature film. It took them over ten years to complete it while running their own business and bringing up kids. I was so very young. I just remember how hard they worked on all their projects. They have such an incredible work ethic. My family proves if you want to make something happen there is always a way. The Knockturnal: What have you learned from your parents about entrepreneurship? Tallia Storm: Everything! My mum had my sister, Valentina, and I [working from the time we were] 8 or 9 years old, interning at her events. We were responsible for helping set up. My parents have taught me [the importance of learning] and embrace your craft – whatever that is. You have to commit to your craft wholeheartedly – through all the ups and downs – never give up no matter what. Also, I think growing up in Glasgow, Scotland; it is a little tougher. You are in the regions of the UK where you have to punch above your weight. [That is what is necessary] if you want to make it in this big competitive world. My father wouldn’t let me pick up an instrument until I could read music. He handed me a theory book at the start of summer. I was eight years old. My father said if I could read music by the end of summer I could choose any instrument I wanted. I, of course, love a challenge. I spent all summer on it and boom – summer was over. I decided to play the flute. It’s not just about entrepreneurship. Life is about art, creativity, and exploration. That’s what my parents taught me. The Knockturnal: Walk your fans through a typical day on the set of “All-Star Driving School”? Still, disaster after disaster came – I never gave up. I really went for those challenges and had such a great time with my instructor. Even so, my mother said, “Maybe you are just born to be driven.” [Laughs] TV was fun, but my family refuses to get in a car with me. The Knockturnal: You were spotted front row during London Fashion Week. Who are some of your favorite designers at present? Tallia Storm: I have always embraced fashion – ever since Santa gave me a sewing machine, at 10. [Laughs] I would try to make my own clothes. When I was traveling [growing up], we always made a point of going to fashion schools. We would borrow clothes from the up and coming designers. For example, Parsons School of Design in NYC and Central Saint Martins in London [provided attire inspiration]. I have been lucky enough to be dressed by iconic brands, including, Dolce & Gabbana, and Gucci for red carpets. Even so, I’m a huge fan of the next generation of talent, to include, Richard Quinn, and my fellow Scot, Christopher Kane. Also, I enjoy designs from Ashley Williams, Fyodor Golan, and another Scot – Charles Jeffrey. My mum actually gave Charles Jeffrey his first internship when he was 17 years old. This happened while living in Glasgow. Take a look at where he is now. My mum has a great knack of spotting great fashion talent. The Knockturnal: What did you learn during your experience on “Celebs Go Dating”? Tallia Storm: The first thing you learn is that these TV shows [crews] become your family. This included everyone from the cast to the crew, and the production team. You are immersed in each other’s lives for months, and it’s wonderful. I had just the best time filming it. I was honest and authentic. If a viewer thought I was too cheeky, then so be it – that’s me. There are no airs and graces with me. What you see is what you get. I won’t pretend to be anything other than who I am. Still, I had no idea it would be such a big deal in the UK. The media coverage was insane, and then the whole world was talking about it. It was their highest rated series to date, which is so cool. I just love being on TV. I have a few more TV irons in the fire, as they say. This will be for 2019, so my fingers are crossed. The Knockturnal: You’re garnering listeners globally. 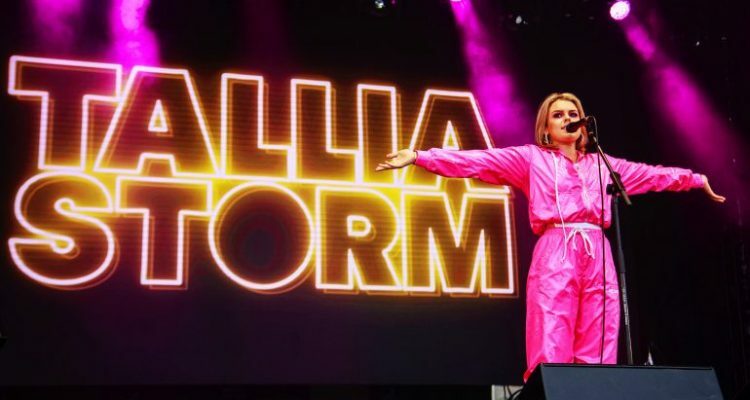 What do you want fans to know about Tallia Storm? Tallia Storm: I am unsigned. I write my music, and I am always hustling. I sing R&B/Soul tracks, and it warms my heart. I like to think I’m authentic with my songwriting. My songs are real, raw and honest — perhaps a little too honest. I think, only if you truly reveal more of yourself, will your fans get to know you. I feel so very grateful to be doing what I do. I will never give up. It’s in the genes. The Knockturnal: Tell listeners what is on the way. Tallia Storm: There will be more music, more TV, more expressionism and more hustle. 2019 is absolutely my year. The Storm is coming. Be ready!